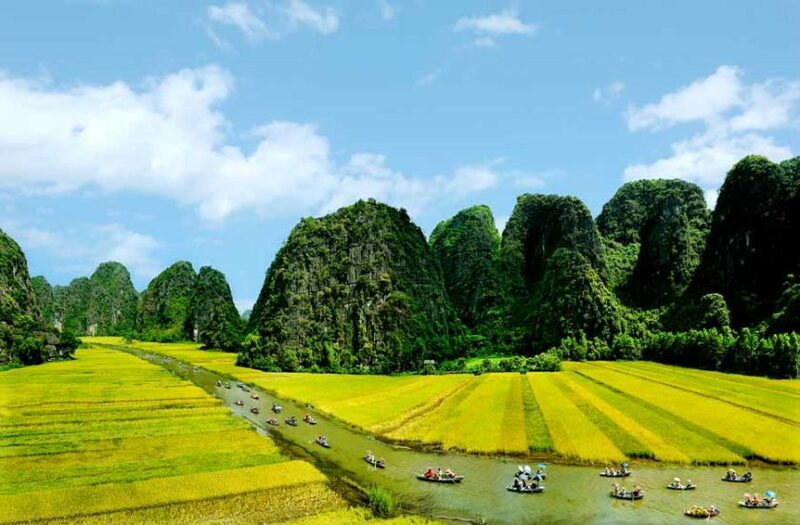 Tam Coc (means Three Grottos), which is one of the most spectacular sights in Vietnam, is what you will encounter after driving along the National Route 1A and passing Ninh Binh City. 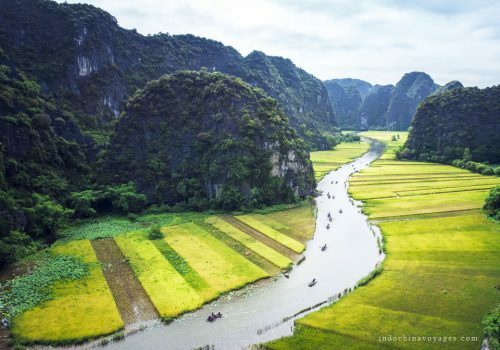 After hiring a boat, you and your boat will be taken through an extensive network of waterways amongst majestic limestone cliffs erecting from the stunning flat rice paddy fields. 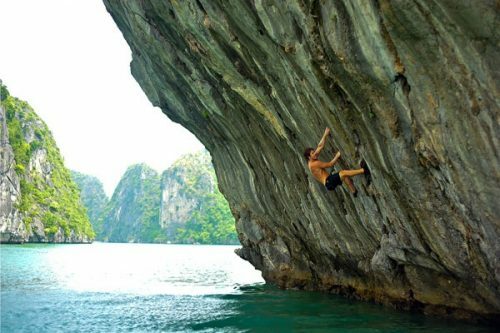 Tam Coc is more accessible and less tourist though the scene still cannot match Halong Bay in terms of the number of limestone mountains and size. 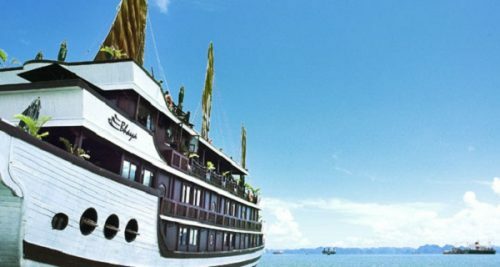 As its name suggests, travelers will undergo three dark and low caves, another gorgeous reminiscence to Halong Bay junk. During this boat trip, you will also have an amazing chance to pay a visit to Bich Dong Temple (free entrance) which provides exceptional views of the surroundings. 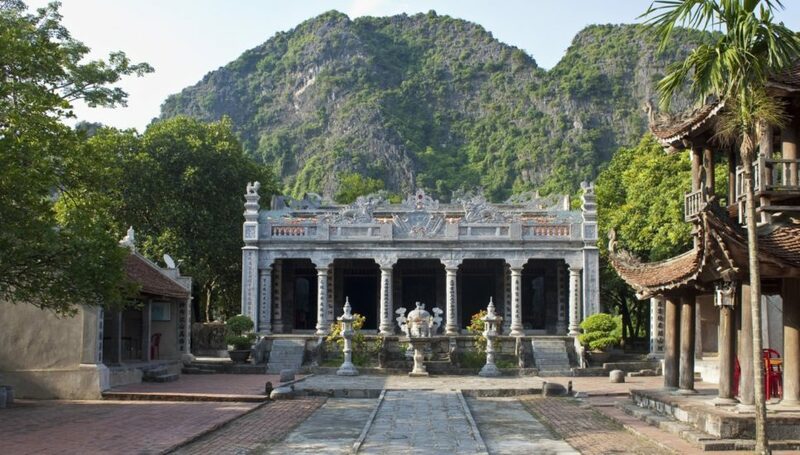 Another nearby attraction quite similar to Tam Coc is Trang An. Trang An Complex owns more caves to pass through but it is more overloaded with people, especially in high season. The morning fog obscures the shape of the precipitous peaks, so, after 10am is the time to go to Tam Coc. Take a ride by road out to Bich Dong Temple, and then come back for the boat trip when things have burned off if you arrive too early when the place is still foggy. However, the open boats offer no shade by midday, when the sun is blistering. En route, you will be attracted by cranes padding around the floating weeds and paddies as well as shy kingfishers flitting about. Quite familiar with the steady stream of tourists, local fishermen are busy paddling about in boats the size of snow saucers and setting nets. Some fishermen use the unique standing technique of leaning forward and pushing the oars in a heaving forward lunge while others row with their feet. The beautiful stroke is easy to watch, but once, try doing it, you will see how hard it is. 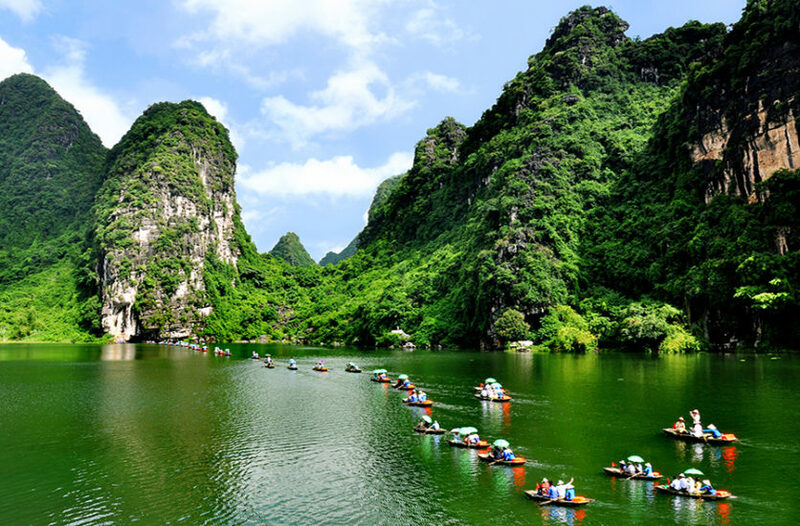 Hoa Lu in Ninh Binh, as Vietnam’s capital city, the royal city a short bike ride away from Ninh Binh City, is the predecessor of Thang Long (the former name of Hanoi). Surrounding Hoa Lu is high limestone mountains which are thought to protect this royal city against invasion. There are several temples including the temple of Dinh Tien Hoang, who liberated the country from the Southern Han in the 10th century and an iconic archway in the entrance inside the complex. To travel from Tam Coc to Cuc Phuong National Park, which is generally a well-preserved rainforest, expect more than one hour drive! Near the entrance is an Endangered Primates Rescue Center that you had better visit with a tour guide. The best choice to slowly stroll through the jungle, the prehistoric trees and the caves is biking. This park also houses many faunas, most notably birds and butterflies. The best time to observe the animals there is at night, but make sure to have an experienced guide accompany with you ! 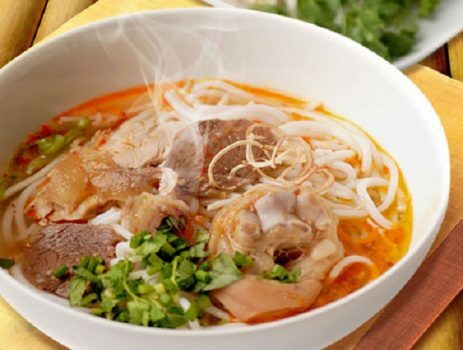 Cuc Phuong is a great choice for a day trip from Hanoi, and if you have four people in your group, you can find some tourist cafes offering programs for as little as $30. However, a day trip means you will arrive in the middle of the day, when the heat and humidity, especially in the spring hot season, can be too much and when jungle animals are fast asleep. Even though the scene is somewhat similar to that in Tam Coc, Van Long Nature Reserve, which is not far away from Cuc Phuong National Park, is well worth taking a one hour boat trip. It is such a great way to have relaxing time while discovering various species of exotic birds living in their natural habitat. There, you can also have a chance to witness the endangered monkey. 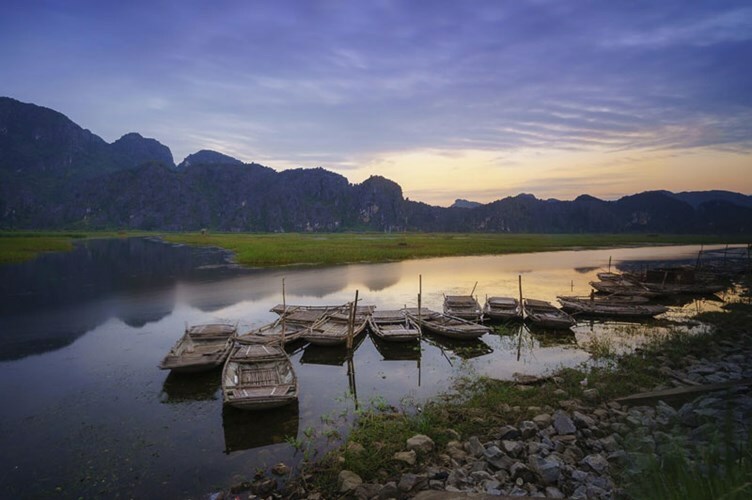 There is no greater way to end an exciting day in Ninh Binh than watching the impressive sunset while meandering along the river at Van Long.